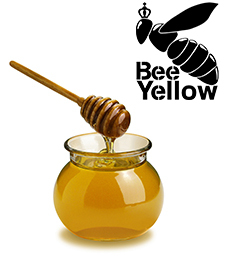 Bee Yellow is a new emerging company that was founded in Cyprus in 2015 and produces bee products of extraordinary quality. The geographical position of the island which incorporates botanical elements from three surrounding continents, along with the ideal climate and abundant flora of over 1.800 species and varieties of flowering plants, provide unique characteristics to our bee products. The most valuable ingredients of our exceptional products are the great love for honey and high level of expertise. Our gamma includes a variety of honeys such as gold, silver and bronze series, based on properties such as the aroma, flavor and hue of the honey. We also offer other bee specialties such as pollen, beeswax, royal jelly, propolis and bee venom. All of our products are certified by a laboratory and strictly follow the European requirements, as the excellent quality is the main driving principal of our company. We perform strict quality control on every aspect of production to ensure that all of our bee products are 100% natural Cypriot products with guaranteed, unaltered quality and taste. Our convenient containers of 250gr and 460gr are distributed throughout the island of Cyprus and travel to the mainland of Greece, other European countries and new overseas markets. With Bee Yellow, Our Nature is on Your Table!